As indicated in lesson 13, there are a variety of ways to accommodate bicyclists on roadways. In many cases, a few simple construction projects can make a big difference for bicyclists, such as replacing unsafe drain grates, filling potholes, or maintaining roadway shoulders so that they are free of debris. Regular roads and streets with no special bicycle provisions. Roadway shoulders or shoulder bikeways. 14.4 Roadway Shoulder or Shoulder Bikeways. 14.10 References and Additional Resources. Figure 14–1. Illustration. Shared roadways include most existing roads and streets. In the United States, most shared roadways have no provisions for bicycle travel and are perceived by many bicyclists to be unsafe or at least uninviting. However, there are some design measures that can be taken to ensure that shared roadways accommodate bicyclists safely and efficiently. This lesson describes several design options for shared roadways, including wide curb lanes, shoulder bikeways, and bicycle boulevards. There is also a discussion of practices to be avoided, such as sidewalk bikeways. There are no specific bicycle standards for most shared roadways; they are simply the roads that currently exist as local urban or rural roads and highways. Mile for mile, shared roadways are the most common bikeway type. Shared roadways are suitable in urban areas on streets with low speeds—40 km/h (25 mi/h) or less—or low traffic volumes (3,000 vehicles per day or less, depending on speed and land use). In rural areas, the suitability of a shared roadway decreases as traffic speeds and volumes increase, especially on roads with poor sight distances. Where bicycle use or demand is potentially high, roads should be widened to include paved shoulders or shoulder bikeways if the travel speeds and volumes on the roadway are high. Many urban local streets carry excessive traffic volumes at speeds higher than they were designed to carry. These can function as shared roadways if traffic speeds and volumes are reduced. There are many traffic calming techniques that can make these streets more amenable to bicycling on the road. A wide curb lane may be provided where there is inadequate width to provide bike lanes or shoulder bikeways. This may occur on retrofit projects where there are severe physical constraints and all other options have been pursued, such as removing parking or narrowing travel lanes. Wide curb lanes can often be installed by narrowing inner lanes on a multilane arterial, thereby reallocating roadway space so that the outside (curb) lanes are wider (see lesson 15 for roadway retrofit solutions). Wide curb lanes are not particularly attractive to most bicyclists, as they do not specifically designate road space for bicyclists. Wide curb lanes simply allow motor vehicles to pass bicyclists within a travel lane. In general, 4.2 m (14 ft) of usable lane width is the recommended width for shared–use in a wide curb lane (see figures 14–2 and 14–3). Usable width is normally measured from the edge stripe to the centerline or adjacent lane stripe, and the gutter pan should not be included as usable width. A wider curb lane (up to 4.5 m (15 ft)) may be appropriate on steep grades where bicyclists need more maneuvering space. The increased width may also be appropriate in areas where drainage grates, raised reflectors, or other pavement features detract from usable width. With these exceptions in mind, wide curb lanes greater than 4.2 m (14 ft) that extend continuously may encourage two motor vehicles to share a lane, and are therefore not recommended. In situations where more than 4.5 m (15 ft) of pavement width exist, a bike lane or paved shoulder should be considered. Figure 14–2. Illustration. Example of a wide curb lane. Figure 14–3. Photo. Motorists overtaking bicyclists in a wide curb lane. 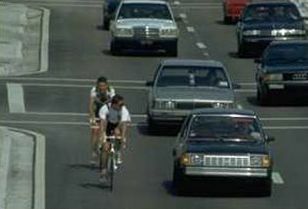 (This picture shows bicyclists not wearing helmets. A few cities in Canada and the United States (most notably Denver) have experimented with placing a bicycle symbol with an arrow along the right side of wide curb lanes at regular intervals (see figures 14–4 and 14–5). Called a hybrid bicycle lane, this bicycle facility has not been endorsed by the AASHTO Guide or other bicycle facility design manuals. The use of this bicycle pavement marking is suggested to offer the advantages of bicycle lanes along with many of the problems associated with bicycle lanes. Proponents of this treatment indicate that the bicycle symbol clearly indicates the right side of the wide curb lane for bicyclists, while also alerting motorists to the potential presence of bicyclists on the road. There are currently no standards or guidance on how to deal with bus routes on shared roadway facilities having wide curb lanes. Extra space is needed for a bus to overtake a bicycle, so a wider curb lane (up to 4.5 m (15 ft)) may be appropriate. If both bus and bicycle traffic is significant, other alternatives besides a shared roadway should probably be considered. In some cities, a shared bus and bike lane accommodates both groups and ranges from 4.2 to 4.9 m (14 to 16 ft). Other cities have chosen to separate these two road users by providing separate bicycle and bus lanes. Figure 14–4. Illustrations. Various pavement markings for shared roadways and wide curb lanes.. Figure 14–5. Illustration. Typical application of shared roadway pavement markings. Space is provided for motorists to stop out of traffic in case of mechanical difficulty, a flat tire, or other emergency. Space is provided to escape potential crashes. Sight distance is improved in cut sections. Space is provided for maintenance operations such as snow removal and storage. Lateral clearance is provided for signs and guardrail. Storm water can be discharged further from the pavement. Structural support is given to the pavement. Paved shoulders, if they are adequately maintained, provide an excellent place for bicyclists to operate. When providing paved shoulders for bicycle use, a minimum width of 1.2 m (4 ft) is recommended (see figure 14–6); however, even 0.6 m (2 ft) of shoulder width will benefit more experienced bicyclists. A shoulder width of 1.5 m (5 ft) is recommended from the face of guardrail, curb, or other roadside barriers. Figure 14–6. Illustration. Example of a paved shoulder or shoulder bikeway. Certain situations may require a wider paved shoulder. On steep grades, it is desirable to maintain a 1.8–m (6–ft) shoulder (minimum of 1.5 m (5 ft)), as cyclists need more space for maneuvering. A 1.8–m (6–ft) shoulder allows a cyclist to ride far enough from the edge of the pavement to avoid debris, yet far enough from passing vehicles to avoid conflict. If there are physical width limitations, a minimum width of 1.2 m (4 ft) from the longitudinal joint between a monolithic curb and gutter and the edge of travel lane may be adequate. Where high bicycle usage is expected, it is desirable to increase the shoulder width. Additional shoulder width may also be appropriate where vehicle speeds are greater than 80 km/h (50 mi/h), or where there is significant truck, bus, or recreational vehicle traffic. The top lift of asphalt adds structural strength. The final lift provides a smooth, seamless joint. The cost is less, as greater quantities of materials will be purchased. Traffic is disrupted only once for both operations. When shoulders are provided as part of new road construction, the pavement structural design should be the same as that of the roadway. There are no planned widening projects for the road section in the foreseeable future. The existing shoulder area and roadbed are stable and there is adequate drainage, or adequate drainage can be provided without major excavation and grading work. The existing travel lanes have adequate width and are in stable condition. The horizontal curvature is not excessive, so the wheels of large vehicles do not track onto the shoulder area (on roads that have generally good horizontal alignment, it may be feasible to build only the insides of curves to full depth). The existing and projected vehicle and heavy truck traffic is not considered excessive (e.g., heavy truck traffic less than 10 percent of total traffic). The thickness of pavement and base material will depend upon local conditions, and engineering judgment should be used. If there are short sections where the travel lanes must be reconstructed or widened, these areas should be constructed to normal full–depth standards. Saw Cutting. A 0.3–m (1–ft) saw cut inside the existing edge of the pavement provides the opportunity to construct a good tight joint. This eliminates a ragged joint at the edge of the existing pavement (see figure 14–7). Figure 14–7. Illustration. Example of a saw–cut pavement joint. Feathering. Feathering the new asphalt onto the existing pavement can work if a fine mix is used and the feather does not extend across the area traveled by bicyclists (see figure 14–8). Figure 14–8. Illustration. Example of a feathered pavement joint. Less of the existing pavement is wasted. The existing asphalt acts as a base. There will not be a full–depth joint between the travel lane and the shoulder. The grindings can be recycled as base for the widened portion. New asphalt can then be laid across the entire width of the shoulder bikeway with no seams. Figure 14–9. Illustration. Example of the use of grindings as pavement base. Wherever a highway is constructed, widened, or overlaid, all gravel driveways and approaches should be paved back 4.5 m (15 ft) to prevent loose gravel from spilling onto the shoulders (see figure 14–10). Figure 14–10. Illustration. A paved driveway apron reduces gravel on roadway shoulders. The route provides continuity to other bicycle facilities such as bike lanes and shared–use paths. The road is a common route for bicyclists through a high–demand corridor. In rural areas, the route is preferred for bicycling because of low motor vehicle traffic volumes or paved shoulder availability. The route extends along local neighborhood streets and collectors that lead to internal neighborhood destinations, such as a park, school, or commercial district. Bike route signs may also be used on streets with bike lanes, as well as on shared–use paths. Regardless of the type of facility or roadway on which they are used, it is recommended that bike route signs always include destination, direction, and distance information (see figure 14–11). Figure 14–11. Illustration. Typical signed shared route signing. In urban areas, signs should be placed every 500 m (approx. 0.25 mile), at every turn, and at all signalized intersections. The signing of shared roadways indicates to bicyclists that there are particular advantages to using these routes compared to alternate routes. This means the responsible agencies have taken action to ensure that these routes are suitable as shared routes and will be maintained as such. The route provides through and direct travel in bicycle–demand corridors. The route connects discontinuous segments of shared–use paths, bike lanes, and/or other bike routes. An effort has been made to adjust traffic control devices (e.g., stop signs, signals) to give greater priority to bicyclists on the route, as opposed to alternative streets. This could include placement of bicycle–sensitive detectors where bicyclists are expected to stop. Street parking has been removed or restricted in areas of critical width to provide improved safety. A smooth surface has been provided (e.g., utility adjusted to grade, bicycle–safe drainage grates installed, potholes filled, etc.). The route will be maintained at sufficient intervals to prevent accumulation of debris (e.g., regular street sweeping). Wider curb lanes are provided compared to parallel roads. Shoulder or curb–lane widths meet or exceed width requirements for shared roadways (1.2–m (4–ft) shoulder; 4.2–m (14–ft) curb lanes). The bicycle boulevard is a refinement of the shared roadway concept in that the operation of a local street is modified to function as a through–street exclusively for bicycles while maintaining local access for automobiles. Traffic calming devices reduce traffic speeds and extensive through traffic. Traffic controls limit conflicts between motorists and bicyclists and give priority to through–bicycle movement. Opportunity—Traditional street grids offer many miles of local streets that can be converted to bicycle boulevards. Low cost—The major costs are for traffic control and traffic calming devices. Traffic calming techniques are increasingly favored by residents who want slower traffic on neighborhood streets. Bicycle travel on local streets is usually compatible with local land uses. Bicycle boulevards may attract new or inexperienced cyclists who do not feel comfortable on arterials and prefer to ride on lower traffic volume streets. Bicycle boulevards can improve conditions for pedestrians, with reduced traffic and improved crossings. They are often located on streets that do not provide direct access to commercial land uses and other destinations; some cyclists may have to negotiate a hostile street environment to complete a portion of their trip. If improperly implemented, they can cause traffic diversion onto other streets. Failure to provide arterial crossings can result in unsafe conditions for bicyclists. Traffic signals may be expensive or unacceptable for the traffic conditions. Successful bicycle boulevard implementation requires careful planning with residents and businesses to avoid unacceptable impacts. Selecting a direct and continuous street, rather than a circuitous route that winds through neighborhoods. Bike boulevards work best on a street grid system. Turning stop signs toward intersecting streets so bicyclists can ride with few interruptions. Placing motor vehicle traffic diverters at key intersections to reduce traffic volumes (the diverters must be designed to allow through–bicycle movement). Placing traffic calming devices on streets to lower traffic speeds. Placing directional signs that route cyclists to key destinations, guide cyclists through difficult situations, and alert motorists to the presence of bicyclists. Using signals where a traffic study has shown that a signal will be safe and effective in ensuring that bicyclists can activate it. Signal loops should be installed where bicyclists stop and should be supplemented with a pushbutton that does not require dismounting. Using median refuges with gaps wide enough to allow bicyclists to pass through (minimum of 2.4 m (8 ft)). The median should be wide enough to provide a refuge (minimum of 3 m (10 ft)). The design should allow bicyclists to see the travel lanes they must cross. Figure 14–12. Illustration. Typical elements of a bicycle boulevard. Rumble strips are provided to alert motorists that they are wandering off the travel lanes onto the shoulder or across the centerline on an undivided highway. They are most common on rural freeways, but are also being considered on other primary and secondary highways. One of a bicyclist’s main concerns about rumble strips is the ability to control the bicycle when traveling across or along the rumble strip for such maneuvers as a left turn or to avoid debris or an obstacle on the paved shoulder. Travel to the right of the rumble strip is generally most beneficial for the bicyclist as long as that area is free of debris and obstacles and the travel path is wide enough to comfortably accommodate the bicycle. A minimum clear path of 0.3 m (1 ft) from the rumble strip to the traveled way. 1.2 m (4 ft) from the rumble strip to the outside edge of paved shoulder (or 1.5 m (5 ft) to an adjacent guardrail, curb, or other obstacle). If existing conditions preclude achieving the minimum desirable clearance, the width of the rumble strip may be decreased or other appropriate alternative solutions should be considered. Rumble strips should only be installed when an adequate unobstructed width of paved surface remains available for bicycle use. To aid a bicyclist's movement to the left of a shoulder rumble strip when needed to avoid debris, make turns, or avoid other shoulder users, some States provide periodic gaps of 3.0 m (10 ft) to 3.6 m (12 ft) between groups of the milled–in elements throughout the length of the shoulder rumble strip. A study by one State recommends a gap of 3.6 m (12 ft) between milled–in elements of 8.5 m (28 ft) to 14.6 m (48 ft) in length. Other States have specified 3.0 m (10 ft) gaps between 3.0–m (10–ft) milled–in elements. Small stones, sand, and other debris often collect on roadway shoulders. Usually the air turbulence caused by passing traffic will keep the portion of the shoulder closest to traffic relatively clear of such debris. For this reason, most bicyclists prefer to ride on that portion of the shoulder nearest to traffic to avoid debris. To provide a clear area beyond the rumble strip for bicycle travel, highway maintenance agencies should periodically sweep shoulders along identified bicycle routes and other routes with high bicycle usage. Recent studies by two States attempted to develop modified rumble strip designs that would be more acceptable to bicyclists. The principle adjustments to the milled–in strip elements considered were reduced depth, reduced width, and changes to the center–to–center spacing. Several types of raised elements have also been tested and evaluated. Both studies concluded that a reasonable compromise between maximum warning to errant motorists and tolerable discomfort to bicyclists was a reduced–depth, milled rumble strip. Some highway agencies have instituted policies that prohibit the use of shoulder rumble strips on roads designated as bike routes or where there is insufficient paved shoulder room remaining to accommodate bicycle travel. Others evaluate the use of rumble strips on a case–by–case basis and often opt to install them only at locations with a history of run–off–road crashes. Other designs being used or investigated employ a skip pattern of rumble strip that provides a smoother travel path throughout portions of the strip and thus allows bicyclists to move to the left when needed. Furthermore, some highway agencies are providing an aid to cyclists and all travelers in general by posting roadside signs, such as RUMBLE STRIPS AHEAD, alerting the traveler to the presence of the shoulder rumble strip. ODOT uses a rumble strip design that meets the AASHTO guidelines (see figure 14–13): 400–mm (16–in) grooves are cut into the shoulder 150 mm (6 in) from the lane edge line. On a 2.4–m (8–ft) shoulder, this leaves 1.8 m (6 ft) of usable shoulder for bicyclists. Figure 14–13. Illustration. Rumble strip guidance provided by ODOT. Groove width of 127 mm (5 in). Flat portion between cuts of 178 mm (7 in). Depth of 10 mm (0.375 in). Flat portion between cuts of 152 mm (6 in). Care must be taken to ensure that drainage grates are bicycle–safe. If not, a bicycle wheel may fall into a slot in the grate, causing the bicyclist to fall. Replacing existing grates with bicycle–safe grates (see A and B in figure 14–14, preferred methods) or welding thin metal straps across the grate perpendicular to the direction of travel (see C in figure 14–14, alternate method) is required. These should be checked periodically to ensure that the straps remain in place. Figure 14–14. Illustration. Examples of bicycle–safe drainage grates. Note that grates with bars perpendicular to the roadway must not be placed at curb cuts, as wheelchairs could get caught in the slots. The most effective way to avoid drainage grate problems is to eliminate them entirely with the use of inlets in the curb face (see figure 14–15). Figure 14–15. Illustration. Example of curb drainage inlet. If a street–surface grate is required for drainage, care must be taken to ensure that the grate is flush with the road surface. Inlets should be raised after a pavement overlay to within 6 mm (0.25 in) of the new surface. If this is not possible or practical, the pavement must taper into drainage inlets so they do not cause an abrupt edge at the inlet. Special care must be taken wherever a bikeway intersects railroad tracks. The most important improvements for bicyclists are smoothness, angle of crossing, and flange openings (see figure 14–16). Smoothness. Concrete performs better than other materials under wet conditions and, when laid with precision, provides a smooth ride. Rubberized crossings provide a durable, smooth crossing, although they tend to become slippery when wet. If asphalt pavement is used, it must be maintained in order to prevent a ridge buildup next to the rails. Timber crossings wear down rapidly and are slippery when wet. Angle of Crossing. The risk is kept to a minimum where the bikeway crosses the tracks at a 90° angle. If the skew angle is less than 45°, special attention should be given to the bikeway alignment to improve the angle of the approach, preferably to 60° or greater, so cyclists can avoid catching their wheels in the flange and losing their balance. Flange Openings. The open flange area between the rail and the roadway surface can cause problems for bicyclists, since it can catch a bicycle wheel, causing the rider to fall. Flange width must be kept to a minimum. Note that the combination of smoothness, angle, and flange opening creates conditions that affect bicyclists. By improving smoothness and flange opening, the angle becomes less critical. Sidewalk ramps can help bicyclists if the bridge sidewalks are wide enough for bicycle use (minimum 1.2 m (4 ft), see figure 14–17). They should be provided where motor vehicle traffic volumes and speeds are high and the shoulders on the bridge are narrow. Figure 14–16. Illustration. Bike lane or shoulder crossing railroad tracks. Figure 14–17. Illustration. Curb ramp provides access to sidewalk. ODOT has more than 20 years of experience designing bikeways, and it has also learned from local city and county experiences. Several practices have proven to be poor ones, including sidewalk bikeways, extruded curbs, and raised pavement markings. These practices are discussed in this section. Some early bikeways used sidewalks for both pedestrians and bicyclists. While in rare instances this type of facility may be necessary, or desirable for use by small children, in most cases it should be avoided. Bicyclists face conflicts with pedestrians. There may be conflicts with utility poles, sign posts, benches, etc. Bicyclists face conflicts at driveways, alleys, and intersections: A bicyclist on a sidewalk is generally not visible to motorists and may emerge unexpectedly. This is especially true of bicyclists who ride opposing adjacent motor vehicles. Bicyclists are put into awkward situations at intersections where they cannot safely act like a vehicle, but are not in the pedestrian flow either, which creates confusion for other road users. Bicyclists are safer when they are allowed to function as roadway vehicle operators rather than as pedestrians. Where constraints do not allow full–width walkways and bikeways, solutions should be sought to accommodate both modes (e.g., narrowing travel lanes or reducing on–street parking). In some urban situations, preference may be given to accommodating pedestrians. Sidewalks should not be signed for bicycle use—the choice should be left to the users. Raised concrete curbs create an undesirable condition when used to separate the motor vehicle lane from a bike lane or paved shoulder: Either one may hit the curb and lose control, with the motor vehicle crossing onto the bikeway or the bicyclist falling onto the roadway. At night, the curbs cast shadows on the lane, reducing the bicyclist’s visibility of the surface. Extruded curbs make bikeways difficult to maintain and tend to collect debris. They are often hit by motor vehicles, causing them to break up and scatter loose pieces onto the roadway surface. The placement of some raised pavement markers or reflectors can deflect a bicycle wheel, causing the bicyclist to lose control. If pavement markers are needed for motorists, they should be installed on the motorist’s side of the lane stripe, and they should have a beveled front edge. Choose a local street that would be a good candidate for a bicycle boulevard. The street segment should be several blocks in length, and should include at least one crossing of a major arterial. Prepare a conceptual design plan for the street segment, showing the location of signing, traffic signals, on–street parking, and traffic calming features. Your design should be shown in plan view, and should be accompanied by a narrative explaining the purpose of special design features. A Policy on Geometric Design of Highways and Streets, AASHTO, Washington, DC, 2004. Roadway Shoulder Rumble Strips, Technical Advisory T 5040.35, FHWA, available online at https://www.fhwa.dot.gov/legsregs/directives/techadvs/t504035.htm, accessed April 27, 2004. Outcalt, W., Bicycle–Friendly Rumble Strips, Colorado Department of Transportation, Publication No. CDOT–DTD–R–2001–4, May 2001, available online at http://www.dot.state.co.us/publications/Bicycle%20Friendly/BFRSW.pdf, accessed April 27, 2004. Elefteriadou, L., M. El–Gindy, D. Torbic, P. Garvey, A. Homan, Z. Jiang, B. Pecheux, and R. Tallon, Bicycle–Tolerable Shoulder Rumble Strips, Pennsylvania Department of Transportation, March 2000, available online at http://www.pti.psu.edu/mautc/docs/MA–III–0008.pdf, accessed April 27, 2004. MUTCD, FHWA, revised edition, November 2003, Washington, D.C., available online at http://mutcd.fhwa.dot.gov/HTM/2003/html–index.htm, accessed February 25, 2004.